When you go to a health facility, are you able to see the same doctor or nurse as the last time you visited? If you see a specialist, do they use information from your primary care doctor to inform your diagnosis and treatment? Are you referred to a higher-level facility, if necessary, for follow-up care? For some of us, the answer is yes. But for too many of us, the answer is no. Continuity of care is a critical component of strong primary health care (PHC) systems that are able to deliver reliable and effective care over time. Strong primary care systems build continuous, participatory relationships between patients and providers to foster mutual understanding and self-reliance. Continuity plays an instrumental role in ensuring patient satisfaction and better uptake of routine health services such as immunization and preventative services, and ensures that the patient experience is positive and consistent between primary, secondary, and tertiary levels of care. Relational continuity – Is there an ongoing relationship between a patient and his or her health care providers? Informational continuity – Are information on past events and personal circumstances used to determine which care is appropriate for each individual? Management continuity – Are services provided by different providers timely and complementary so that care is connected and coherent? For patients and their families, continuity means that providers know which illnesses they’ve confronted and the care they received for them. It means that different providers agree on a treatment plan, and that a provider who knows them will deliver their future care. In a system with high continuity, a woman in her second pregnancy will see the same provider who delivered her antenatal care in her first pregnancy, and that provider will ensure that the facility in which she delivers her child is aware of the postpartum hemorrhage that occurred in her first delivery. For providers, continuity means they have sufficient information about a patient to provide appropriate care and are confident that their care inputs will be followed up by other providers. The rise of chronic conditions in addition to increased life expectancy means that people will need to be seen by more and more health care providers over the course of their lives for a variety of needs. Many PHC systems are characterized by fragmented care across providers and services, making it increasingly difficult to provide people with an integrated, continuous care experience through all life stages. Evidence from high-performing countries shows an association between PHC systems with high continuity and improved patient health outcomes, better access to care, less use of emergency services, lower costs, and improved patient experiences. Data Deep Dive: How does PHCPI measure continuity? There are few measures of continuity that are available across low- and middle-income countries. In the absence of globally comparable metrics, PHCPI uses three proxy indicators to measure continuity in PHC systems: diptheria-tetanus-pertussis (DTP) dropout rate, antenatal care (ANC) dropout rate, and tuberculosis (TB) treatment success rate. These indicators reflect a health system’s ability to reach patients when they need care, follow up over extended periods of time, and share information across care providers. DTP dropout rate is the percent of children who do not receive three total doses of the DTP vaccine after receiving an initial dose. In order for a child to receive all three doses of the DTP vaccine, there must be a health care provider who actively follows up with the child’s caretaker at regular intervals, a caretaker who is knowledgeable and empowered to seek care, accurate information indicating the child is due for a dose of the vaccine, and the supplies and setting necessary to administer the vaccine. All of these elements require strong continuity in PHC systems. The graph below shows that nearly two thirds of countries—highlighted in the orange box—are meeting or exceeding the UNICEF benchmark of a DTP dropout rate lower than 10%, with 22 countries reporting that all children who receive an initial vaccine dose go on to receive all three required vaccines. However, 32 countries are not meeting the benchmark and in 8 countries, weak continuity of care means that more than 1 in 5 children who initiate vaccination do not receive the three doses necessary to protect them from life-threatening diseases. ANC dropout rate reflects the percent of women who do not receive the WHO-recommended four ANC visits after receiving one initial visit. Low ANC dropout rates require a health system to encourage women to seek care, identify them early in their pregnancies, educate them on the importance of ANC, and reach them multiple times throughout their pregnancy. The graphs below show how ANC dropout rates tend to decrease as country income level increases; the colored bars in each graph represent countries in each income group. In 11 out of 119 low-income countries, more than half of women who initiate ANC do not complete their four visits, compared to one-third of women in the poorest performing upper-middle income country. The markedly lower ANC dropout rates in many middle-income countries show that many of these countries have been able to build systems that deliver more continuous care. However, economic development is not the only answer; some low-income countries deliver strong ANC care and surpass their middle-income counterparts. TB treatment success rate is the percent of all TB cases that successfully complete treatment. The cure rate of complex diseases like TB is a proxy for a number of aspects of successful service delivery and continuous care within a health system: it reflects providers’ ability to accurately diagnose and treat a patient, and then follow up over time to ensure the patient is adhering to a detailed treatment plan that requires frequent contact with the health system either in facilities or at patients’ homes over at least a six month period. Unfortunately, 62 out of 132 countries do not demonstrate the strong continuity needed to achieve the WHO benchmark of an 85% treatment success rate. Despite poor performance of some countries there are also success stories: five countries report treatment success rates above 95%. When looking at how countries perform on one measure of continuity, the story seems quite clear—can a country deliver life-saving vaccines, provide essential services, or successfully manage complex illness? However, when examining how countries perform across multiple continuity indicators, the view of continuity in a primary health care system becomes hazy. For example, Thailand has one of the lowest DTP3 dropout rates (0%) and a low ANC dropout rate (4.8%), but its TB treatment success rate falls below the international benchmark of 85%. Could this be that the high volume of TB cases in Thailand makes it difficult for providers to track and treat so many cases? Or, could PHC providers be well-equipped to deliver essential maternal and child health services, but less able to manage other conditions? Exploring questions like these can help understand why a country with a strong PHC system is able to deliver excellent continuity for some populations, but falls short for others. 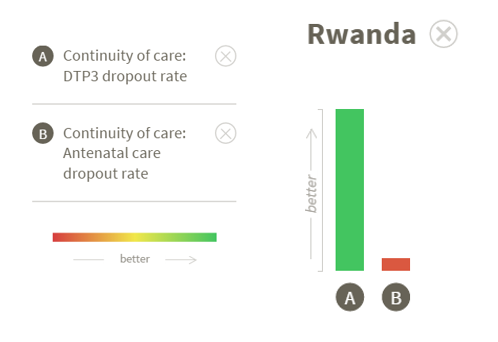 Another interesting case is Rwanda, which has one of the lowest dropout rates (0%) between the first and third doses of the DTP vaccine, but one of the highest dropout rates (55%) between the first and fourth antenatal care visits. This raises the interesting question of what causes the major differences in continuity between child care and maternal care? Are immunization programs better funded than maternal health programs? Are patients dissuaded from returning to the ANC site because of a negative experience? If so, was the negative experience medical—related to the care or treatment—or did other factors like high cost, wait time, or provider attitude lead to the poor experience? Are there gaps that exist in the management and information systems that track patients and remind them of ANC visits, but don’t apply to DTP vaccination? The answer is likely a combination of many factors, some of which may even be unrelated to the health system, but underscore how truly difficult it is for PHC systems to deliver high-quality, continuous care for all. In order to better understand the essential function of continuity, we must move beyond proxy indicators. As the burden of non-communicable diseases rises, continuity in PHC will only become more important if systems are to successfully manage patients with multiple chronic conditions and control costs. Countries need timely and comparable data on functions that span across the health system to help them understand how they are performing over time and where to invest for “best bets” in improvement. It is widely understood that continuity is important, but it is time to think critically about how to better measure and improve this critical aspect of health service delivery. Want to learn more? Visit PHC Evidence to explore additional literature about the importance of continuity in PHC. Erin Fenton is a Senior Program Associate at Results for Development.